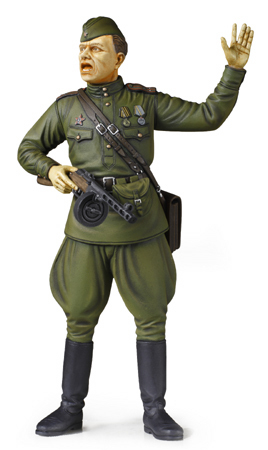 ★1/16 scale plastic assembly kit model of the Russian Field Commander. ★The commander, holding a PPSh-41 submachine gun and ordering his unit to move forward, has been realistically reproduced. ★The model features late-war style uniform which has shoulder badges. ★A 3-piece face as well as separate parts for the jacket hem and garrison cap enhance the model's realism. ★Equipment such as magazine pouch, map case, and holster are included. ★Decals to depict shoulder badges, medals, and pupils are also included. From 1943 to the end of WWII, Russian officers wore the same rubashka uniform as enlisted soldiers but were issued with leather boots as opposed to standard boots or leggings made from lower quality materials. Rank was distinguished by shoulder badges, which had different hem colors to identify unit type. In addition to helmets and officer caps, field commanders also wore pilotka garrison caps. On the battlefield, they carried Tokarev pistols and PPsh41 submachine guns while leading units.